Congratulations – an Apprenticeship for a former students!!! 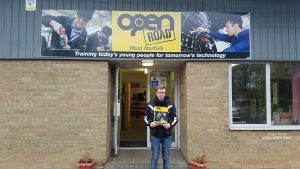 “I attended Open Road from January 2016 till May 2017 and gained Level 1 Award and Certificate Vehicle Maintenance and Level 1 Award in Transport Maintenance. All the staff at Open Road are caring and help every young person to achieve the most they can. The team made me aware of an apprenticeship opportunity at Snap-On and although I left Open Road in May 2017 Aaron helped me with my CV and Robin submitted it to Snap-On. I have been accepted onto the scheme and start with them as soon as possible. Without the help of Open Road staff I would not have had this fantastic opportunity and I am very happy, and a little shocked.